Professor Bocko earned his PhD in Physics from the University of Rochester in 1984, and after a brief postdoc, joined the ECE department in 1985. Currently, he serves as the Department Chairperson. He has research and teaching experience in the areas of sensors and transducers, low-noise electronics, high speed digital superconducting electronics, quantum coherent electronics and quantum noise, microelectronic fabrication, microwaves, nonlinear dynamics, digital signal processing, musical acoustics, and digital audio. Professor Bocko has enjoyed teaching courses on solid state devices, microwaves, nonlinear dynamics, circuits, DSP in audio, and engineering design. 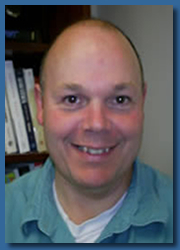 Currently, his teaching is in primarily in the latter two areas. Over the years, he was won three separate teaching awards at the University of Rochester.